Outlook Recovery Toolbox (download) is a software product for restoring destroyed or damaged data files of Microsoft Outlook mail client included into the Microsoft Office package. Outlook stores its data in PST or OST files; these files contain messages, contacts, tasks, notes, appointments, and journals. 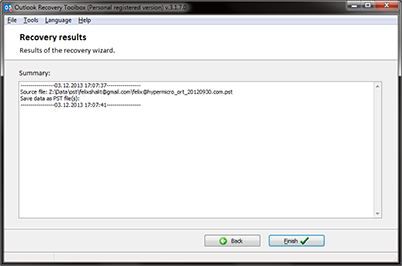 Outlook Recovery Toolbox reads the damaged PST or OST file, identifies and restores information in the file. Outlook Recovery Toolbox saves the recovered information in a new PST file or in several files, each one being maximum 1 Gb large. The folder structure of new PST files is similar to the original data structure of the damaged files. Messages and other objects are recovered with attachments, if they have any. The program is a simple, clear and easy to use wizard. PST files created by Outlook Recovery Toolboxcan be easily transported and added to Outlook. An important feature of the program is that it does not re-index, modify or delete initial data files. The recovering Outlook emails, contacts, notes, appointment and tasks is just coping all objects into new PST files (or .eml, .vcf and .txt files). The tool can recover Outlook emails and save it as .eml files. The software can read and convert Offline Storage files (.ost files) of Microsoft Exchange to .pst files of Microsoft Outlook (convert .ost to .pst files, convert ost to pst). Outlook Recovery Toolbox is the ost to pst converter (convert .ost to .pst, convert ost to pst) and the ost recovery tool too. In one session, the program restores information from one PST file only. To recover information from several files you should follow all the wizard's instructions again for each file. On the second page of the Microsoft Outlook mail recovery software offered a list of all recovered objects. The second page of Outlook Recovery Toolbox looks like a pst viewer. Microsoft Outlook recovery tool fix pst files without updating and modifing the source pst files. The Outlook folder recovery tool is distributed with shareware limitations, so an unregistered user can't restore more than 5 objects from each folder of the original damaged pst file. If the user is satisfied with the program's capabilities in recovering data, the user can buy the full version of the program on-line and restore the lost information completely. The Microsoft Outlook mail recovery software is distributed under a Try before Buy license and the user can test the program's functionality before buying it. You can test the recovery possibility of pst fix tool before a purchasing. Custmer can partially fix pst files in a Demo version of the program. How to recover Outlook emails? Recovered messages are stored in eml files (compatible with most mail clients, for example, Outlook Express). That means that each object from Outlook folders is saved to a separate file. When information is saved as separate files, the folder structure on the disk will be similar to the original folder structure in the original PST file. So, the Microsoft Outlook Inbox repair tool can be used for extracting messages, contacts and notes from Outlook data files. In Outlook it's impossible to export messages in eml format. PST fix tool reads data from PST files of Outlook 97, Outlook 98, Outlook 2000, Outlook XP, Outlook 2002, Outlook 2003, Outlook 2007. Reads data from OST files created by Exchange 5.0, Exchange 5.5, Exchange 2000, Exchange 2003 (convert .ost to .pst, convert ost to pst). Recover ost files with a size more then 4Gb. Restores data from files protected with a password. 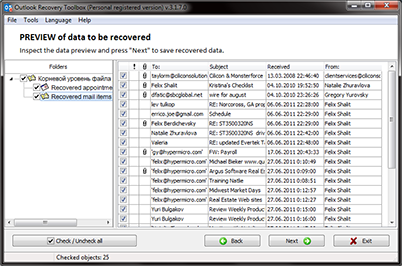 The Ost recovery tool can recover ost files protected with a password. The recover Outlook files tool read files larger than 2Gb; maximum size of original files is 4Tb. Microsoft Outlook recovery tool compatible with Windows 98, Windows Me, Windows NT 4.0, Windows 2000, Windows XP, Windows 2003. Microsoft Outlook recovery tool can fix pst files under Windows 98. Recover outlook emails under Windows Me. Recover outlook emails under Windows 2000. Outlook folder recovery tool have not limitation ona quantity of recovered folders or files. Microsoft Outlook Inbox repair tool is the ost to pst converter of Microsoft Exchange files (convert ost pst). 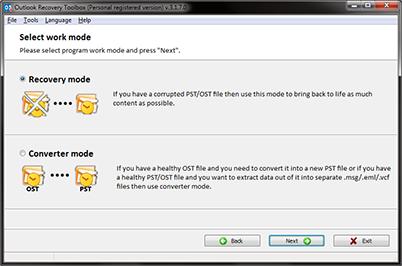 Note: The program can create a new PST file only if Outlook 98 and above is installed on a computer. Outlook Recovery Toolbox can't write data into new PST file with help of Outlook 97. Microsoft Outlook Inbox repair tool creates a new PST file in a format same as well as Microsoft Outlook installed on a computer. 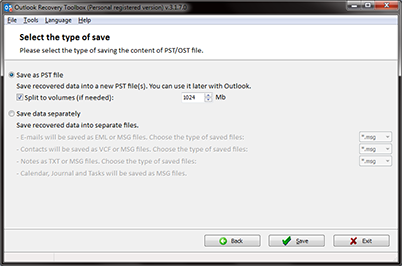 For a conversion of OST files to PST files (convert ost pst, convert ost to pst) Microsoft Outlook must be installed on a computer. The ost to pst converter (convert .ost to .pst) work with Microsoft Outlook 98 and higher. How recover Outlook emails and Where to get PST fix tool? How to recover ost files (convert ost pst)? Where to find a description of recovering Outlook emails? Where download Microsoft Outlook Inbox repair tool? Note: If need to recover Outlook Express emails, folders or DBX files then you should use OE-Mail Recovery tool. See the description: How to repair Outlook Express folder? 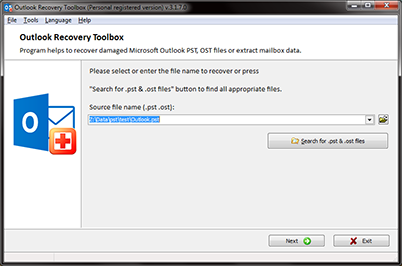 Outlook Recovery Toolbox helps to fix damaged Personal Store Folders files (*.pst) of Microsoft Outlook. And tool save a recovered messages, contacts and so on into new PST files or *.msg, *.eml files.